Cook quinoa in 2 cups of water according to package directions until fluffy and put in a large bowl. 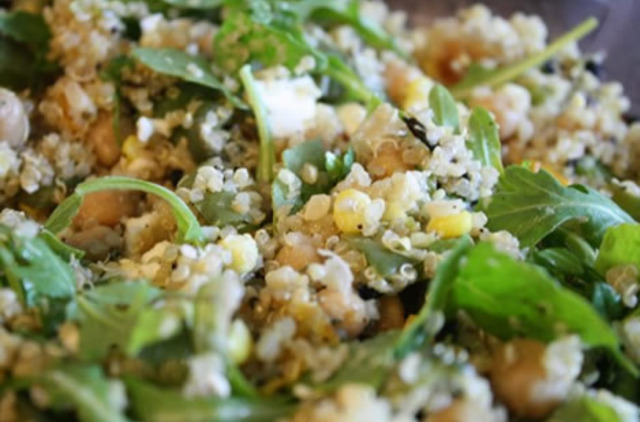 Cut corn from ears of corn and add to bowl of quinoa. Add beans and toss well to mix. Preheat oven to 500 degrees F on the broil setting. Oil two large baking sheets using 1 tsp. of oil for each pan. Toss vegetables with oil (peppers, tomatoes, onion, and garlic) or spray well with a Misto. Place vegetables on the two pans, trying not to let them overlap if possible. Roast for about 10 minutes. Stir the vegetables and flip them with a spatula. Allow to roast an additional 5 minutes, or until they begin to brown. Remove from pan and allow to cool for 10 minutes. Toss vegetables with the quinoa mixture. Crumble feta cheese and add to the salad. Add arugula, rosemary, salt, and pepper to taste. Toss the salad well and serve slightly chilled or at room temperature. *May substitute with any color of bell pepper. ** May substitute with any variety of tomato, but cherry tomatoes would make the best substitute.